School of Law, Sharda University actively organizes as well as participates in Curricular and Co-Curricular Activities in Campus and out Campus for the overall development of the faculty/students and enriching the practical knowledge of the budding lawyers. As part of the experiential learning, School of Law, Sharda University actively organizes as well as participates in Curricular and Co-Curricular Activities in Campus and out Campus for the overall development of the faculty/students and enriching the practical knowledge of the budding lawyers. The event shall be inaugurated by Hon’ble Mr. Justice A. K. Sikri, Former Judge, Supreme Court of India. The event shall also be addressed by legal luminaries such as Prof. Upendra Baxi and Mr. Fali S. Nariman. • To provide opportunity to the Faculty/Students to interact with the top Legal Luminaries. • This visit shall provide an avenue to contribute in suggesting possible solutions and remedies in the pursuit of reforming Legal Education in India. Learning new concepts among normally developing children is natural to the process of growing up. But there are some children who despite of normal intellectual capacity and normal visual, hearing and physical abilities are yet unable to acquire the basic language and arithmetical skills as per there age. Learning Disability is a neuro-developmental disorder that affects the brain’s ability to receive processes, store and respond to information expressed in printed or written form. This specific disability not only affects academic performance and achievement but also hampers the self-concept and emotional well being. In view of above points School of Education is organising a one day workshop on the topic Learning Disability (LD): Identification, assessment & First Level Psychological Aids in collaboration with Kasturba Institute of Psychological & Behavioural Medicine(KIPBM) on 15 April 2019. To build up awareness and knowledge among student teachers and faculty about Learning Disability. Equip student teachers with basic skills to identify and assess Learning Disability. Provide First level Aid to children identified with Learning Disability. School of Humanities & Social Sciences (SHSS) and Sharda Skills are jointly organizing literature festival ‘INKWASH 2019’ to be held on 15th & 16th April 2019. It aims to bring languages from all cultures as well as languages and cultures from different region both national and international into one forum to interact and showcases their perception of culture. This year the theme of the festival is ‘Adaptations’. To Register online, please follow the link below and pay via paytm on 8979825554. Journal Club Activity | Department of Mathematics & CARAMP (SBSR) | Organizing an Invited Lecture on “Data Mining and Wavelets” by Prof. P. Manchanda | 15th April 2019. @ BIC Board room, Block-1. Department of Mathematics and Centre for Advanced Research in Applied Mathematics & Physics (CARAMP), SBSR, Sharda University is organizing an invited lecture on “Data Mining and Wavelets” by Prof. P. Manchanda (Professor & Head, Department of Mathematics, Guru Nanak Dev University, Amritsar). She is Secretary of Indian Society of Industrial and Applied Mathematics (ISIAM). She is actively engaged in research and has published more than 50 research papers in well-reputed international journals. Data mining is comparatively new interdisciplinary field developed by joint efforts of mathematicians, statisticians, computer scientists and engineers. In the talk, some important ingredients of this field along with their applications in real word problems will be presented. Applications of wavelet methods to data mining particularly denoising, dimension reduction, feature extraction, similarity search, etc will be discussed. To create interest in advanced research using data mining techniques and promote interdisciplinary and innovative research. The session is open for all PG students and faculty members. Date: 15th April, 2019| Time: 11:30 AM | Venue: BIC Board room, Block-1. Department of General Management, School of Business Studies (SBS), Sharda University, is Organising a Workshop on ‘Resume Writing’ on 15th April 2019 for MBA-Healthcare and Hospital Administration students of SBS. The software workshop will introduce the concepts of Revit to B Tech (2nd year) Civil Engg. students. This software is an Industry-standard and is used by structural engineers, architects and other building professionals to help reduce risk, obtain insight into how buildings will perform before construction begins, develop better quality designs, and improve project delivery. The event is aimed at introducing the students to the Revit software and its utility. IQAC is organising a training program for the Peoplesoft champions of SMSR and SAP on 16/04/2019, from 1.30 to 3.30 p.m. in IQAC, board room block II. The trainer for the same is Dr. Rashmi Priyadharshani, Unversity level champion of Peoplesoft. The main objective of this program is to provide training related to PeopleSoft. The content covered will be catalog creation, scheduling in the new term, grade book creation for result and course mapping with students and faculty. In Greater Noida, Pari Chowk is the main landmark by which the city is identified. The city is an extremely well-planned city with a good wide road network. Unfortunately, over the years, haphazard growth, un-monitored rise in traffic and poor obedience of traffic rules has led to major traffic jams at Pari Chowk, thus taking a lot of sheen out of the beautiful landmark. As part of their contribution to the society, the children of third year B Tech Civil Engineering have been asked to do a study on the traffic pattern and volume at Pari Chowk and provide the best, least cost and permanent solution to the traffic problem of Pari Chowk. To teach the students how to carry out a traffic volume survey. Analyse the results and as part of their contribution to the society provide the best, least cost and permanent solution to the traffic problem of Pari Chowk. 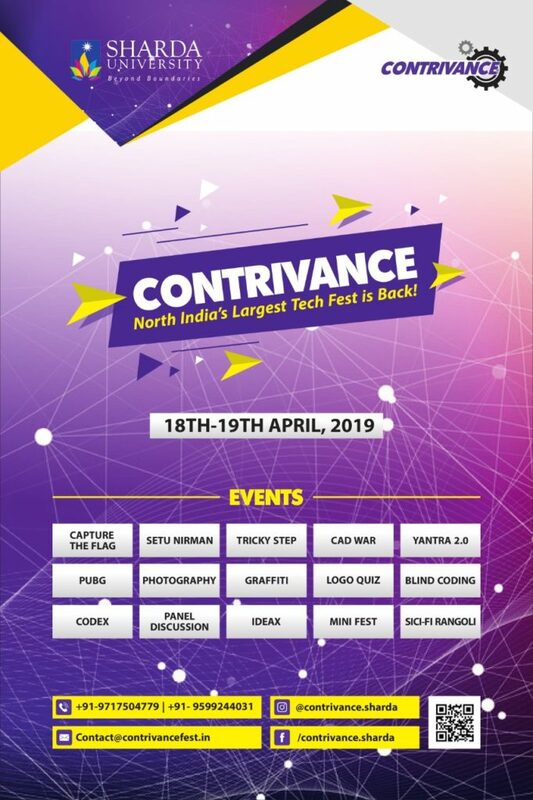 Department of Computer Science and Engineering, School of Engineering and Technology (SET), is organizing an event in presence of Founder and CEO of GeeksforGeeks, Mr. Sandeep Jain on 16th April 2019. The event focuses on life experiences and technology. It also focuses on the thoughts of students towards innovative skills. This event is a part of learning and growth to everyone. 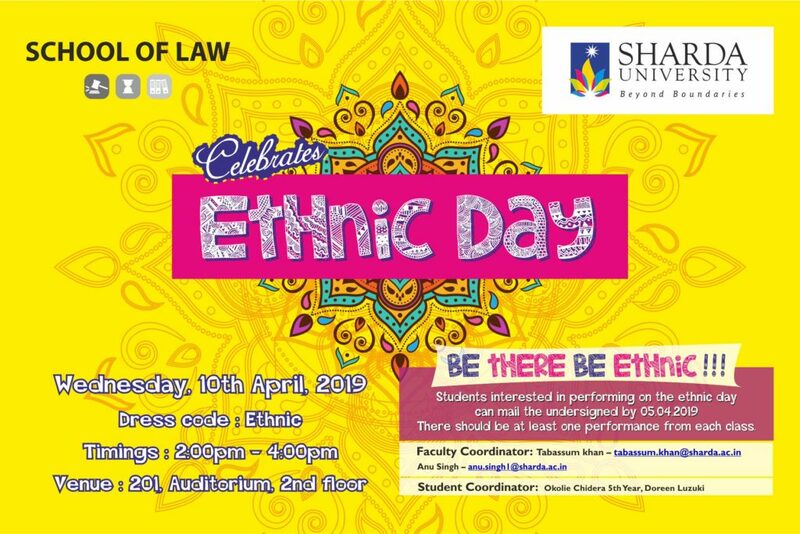 School of Law, Sharda University is celebrating “Ethic Day” on Wednesday, 10th April 2019, 2.00 PM to 4.00 PM. This event aims at encouraging students to foster cultural exchange and to showcase their ethnic dresses. The event also seeks to promote student interaction and to infuse joy of shared culture. As part of the Community Connect Programme, School of Law, Sharda University is organizing Faculty & Students visit to District Consumer Disputes Redressal Forum, Greater Noida on Thursday, 18th April 2019. To enhance the learning on consumer rights. To make students learn, observe and apply the theoretical understanding of the Consumer Protection Act. To understand Socio-Legal Issues of various stakeholders. The students will learn court craft & etiquettes. Students shall prepare questionnaire for project report. Date: Thursday, 18th April, 2019. Venue: District Consumer Disputes Redressal Forum, Surajpur, Gautam Budh Nagar, Greater Noida.